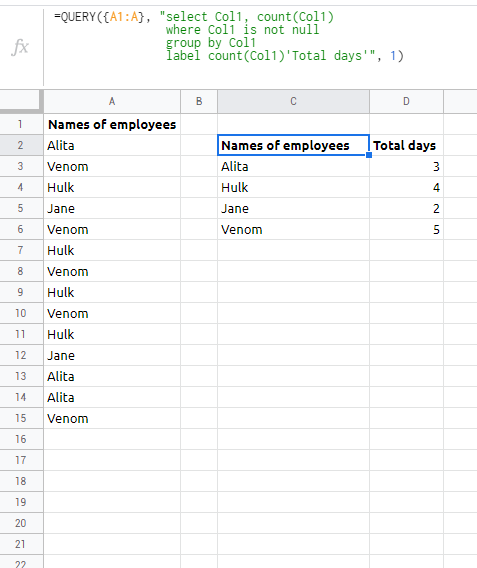 I am creating a spreadsheet in Google Sheets for a client who wants the sheet to pull data from their Google Calendar to calculate how many days each employee works. They use Calendar for their scheduling. So I know that I need the formula to look through the calendar for the specific employee name, and then count how many days they work in a 3-month period. Hours worked aren't counted, just days. The client would like the spreadsheet to just stay up to date, but if that's not possible, then I would put a link or button in B1. I'm thinking that I'll need formulae in A, B, C and D to the effect of =FIND("drname" =FIND("officeabbreviation", yadda yadda yadda. But I don't know the specifics of the yadda yadda yadda. I do have a table that I can MATCH INDEX for the Dr's names and Office abbreviations. Edit 2 I do need to know how to import the Calendar to Sheets, as well as the formulas. How do I create a formula that will tell me if something is paid, or days overdue? How can I list rows meeting a criteria and limit the amount of rows by a sum of the list?